While a review copy of Hoax Hunters #13 quenched my thirst, I can’t wait until its release date of January 8, 2013. 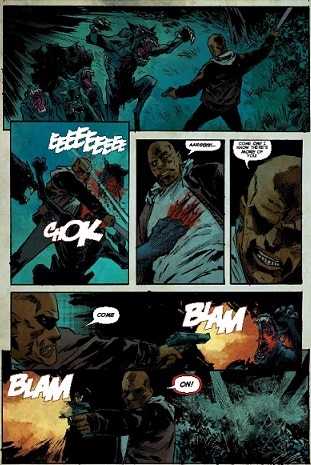 Holding a print copy in my hands will provide instant gratification, especially with Christian Dibari (artist) and Mike Spicer (colorist) providing the visuals. The season finale is here, and will leave you in a WTF moment. And the ending is more dark and twisted than all the issues combined. While fighting the demon, in an effort to secure the Book of All Futures, Regan makes the shocking discovery that she’s more powerful than she realizes. Fearing that Regan’s connection to the book will be discovered, Donovan warns her that they must flee to safety. Meanwhile, the moment we’ve been waiting for is here. Or is it? Up until now, Jack Lawson, the handsome team leader, has been a loyal member of the Hoax Hunters. But throughout the series, he’s been harboring his own hidden agenda on the sly. Jack has been searching for his father, who went missing years before. Earlier in the series, Jack was supposed to have given Donovan a multiverse device. But he gave Donovan a replica of the device instead. He kept the original to aid in the search for his father. Getting into a heated argument with his dad’s business partner, Borges, only escalated the situation. But this time, Jack has gone way too far. Once again, Moreci and Seeley produced another dark and twisted horror story. 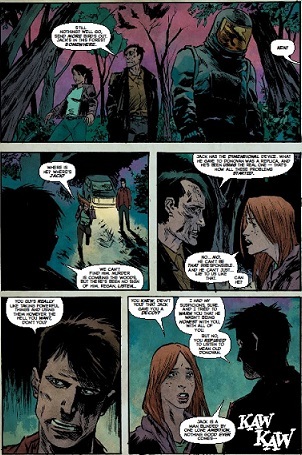 Hoax Hunters is definitely one of the best horror comics on the market. Myths are explored with sharp dialogue and great character interactions. Regan is so powerful, it’s scary. Although I don’t fully trust Donovan, he does appear to have some good in him. Jack appears to have gone stone crazy, and Murder is, well Murder. You can’t read an issue of Hoax Hunters and not mention Murder, the crow filled spacesuit. Dibari and Spicer are to blame for the eye-popping visuals, especially the chupacabras. I also like when Donovan changes from a fine-looking young man into a demonic beast. Without giving any spoilers, I’m posting a couple of pages so you can get a taste of both dialogue and art. So if you’re looking for spoilers, sorry but you’re reading the wrong blog. Now that Season 1 of Hoax Hunters is finished, the creative team is taking a break before Season 2. If you want to read the first season in its entirety, then don’t pay outrageous prices on eBay. Buy the trades or read them here. 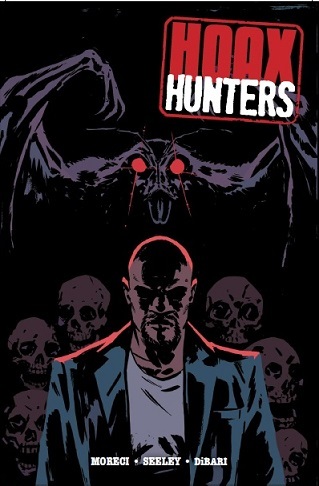 If you’re a fan of horror, mythology, Mythbusters and X-Files, then Hoax Hunters, published by Image Comics, is a title you definitely should be reading. I give this issue 5/5 stars.